Every October we have what is called, by some, the Scenic Drive. It's when every small town in several counties fills with vendors and one can find food, antiques, crafts - all sorts of things. 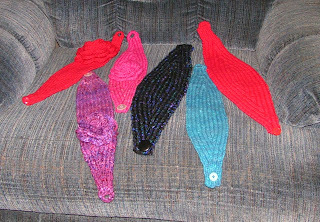 One vendor, somewhere, sells handknit earwarmers. I've seen a few on people - they're a dull brown color and scratchy wool but are rather popular for some reason - I can't imagine that they're very warm, though, because the stitches are very open and loose. My sister-in-law asked recently if I knew how to make them because she'd like some colorful ones to wear while running. Sure, I said, I'll see what I can do. 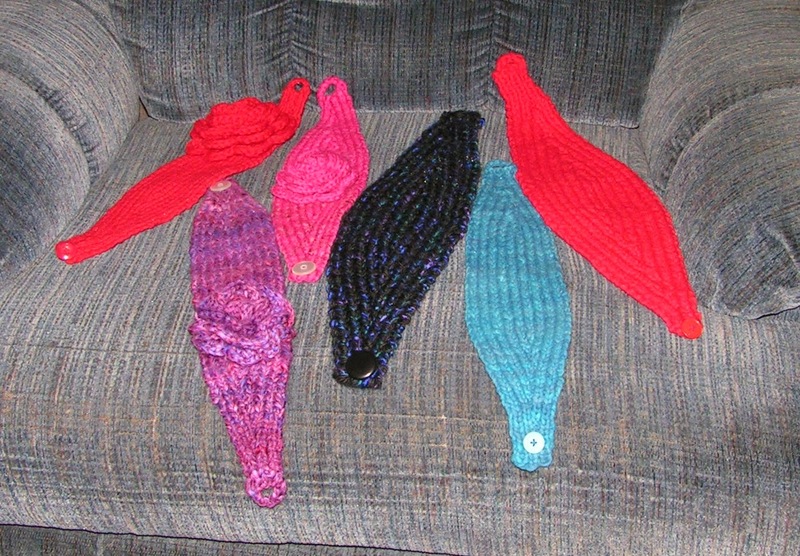 Turns out they're incredibly easy to make - a beginner could knit one in a day. The flowers are crochet. They're just a big spiral, very easy. I didn't sew them to the headband, though. They're attached to alligator clips so she can switch them around or replace them with other flowers. The black one is Khloe's. It's huge because it's a bulky yarn. I made a flower to match but it turned out to be as big as her head - far too huge! According to the weather reports, we're going to have more lovely snow and cold. These should help keep my SIL warm while she's out. Me? I'm staying in with a movie!